The iPad is certainly one of the most well-known devices in the world. 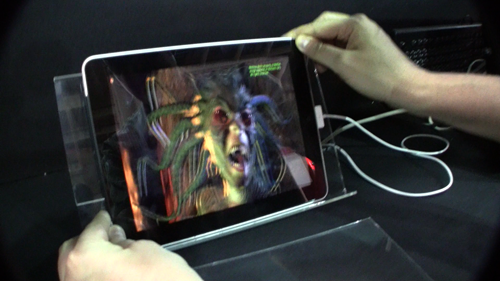 A possible prototype has been spotted at Display Taiwan that seems to be of a 3D-capable iPad. The device, which was spotted at CPT (a display vendor’s) booth, has the Apple logo and all the iPad-related wording covered up with duct tape, although the iPad’s form factor, the aluminum back casing and the iconic connection plug made the device immediately recognizable. It’s unclear whether we’ll see a 3D-capable iPad, or when, but this could be proof that Apple has been experimenting with the technology for quite a while. If we ever do see a 3D iPad, however, it’s almost safe to say glasses won’t be forced on users: 3D goggles seem to completely go against Apple’s notion of natural user interfaces and user experience. Due to the lack of additional reports on 3D in Apple products, it’s also unlikely that we’ll see a 3D display coming to the 2012 iPad. The first-generation iPad hit stores in April last year and was replaced by a second-generation, known as the iPad 2, roughly one year later, although that update included only a few major improvements, such as a front-facing camera. Adding 3D to the iPad sounds like a logical step to expand the functionality of an already mature device, which could make way for the sale of 3D movies in iTunes. This also leaves the door open for the possibility that 3D displays could soon arrive on other Apple products, such as Macs and even iPhones. Other PC makers, such as Toshiba, have already implemented 3D displays onto their high-end netbook computers. Whether Apple plans to adopt 3D on any of its products remains pure speculation at this point, as well as whether the prototype showcased is an official one and not just a proof of concept by an obscure parts maker. Either way, wouldn’t it be great to watch 3D movies on the train?